From within Zentail, you can view your Orders, ship them, cancel them, and much more! Review this article to learn more, or, watch a 1-minute video tour for a brief overview! Needs Attention - what it means and how to take action! There are a number of filters that will pop-up on your Ordes page in Zentail. This allows you to view only specific kinds of orders at a time. Some filters will be there all the time (like 'Shipped' and 'Cancelled') while some will only appear when there are orders that fall under that filter (like 'Prime Pending'). Here's a definition of each filter you'll see on the Orders page! All - As you may have guessed, this allows you to view all of your orders, regardless of status, alerts, or channel! Need to Ship - This will show you all the orders that are pending, or still need to be shipped, from a specific warehouse. Make sure you are viewing the proper warehouse (see "Current Warehouse" above the filters) to understand what orders need to ship from that warehouse. Pending - This shows all pending orders, regardless of what warehouse they were routed to. Needs Attention - Orders in this section have some sort of alert tied to them. Sometimes the alert is from your fulfillment integration (i.e. FBA, ShipStation, your 3PL) stating that there was an issue with the order. Other times, the alert is from the channel (i.e. eBay, Jet, etc..). It's important to pay attention to these alerts and take action when necessary. Prime Pending - Orders in this section have been automatically flagged as a Seller Fulfilled Prime order. You may want to treat these with a bit more urgency to maintain strong seller metrics on Amazon. Batchable - This filter shows all orders where labels can be generated in bulk on Zentail. At the moment, this is only available for accounts that have an EasyPost integration. - Zentail is able to understand the shipping dimensions necessary to generate these labels because these are single unit orders. Return Requested - These are open returns for your orders. You can process returns for Jet and Walmart directly on Zentail. For other channels, you should still process the return or refund directly on the channel. Processing - FBA or a Zentail approved 3PL has accepted a fulfillment order and Zentail is awaiting the order to be shipped. Once tracking is provided by FBA/3PL the order's status will automatically change to Shipped and the channel will be updated. - Orders in this filter will have a status of Accepted (meaning FBA/3PL has accepted the data for the shipment) or Pending (meaning FBA/3PL has not yet accepted the data for the shipment). Pending Payment - Orders that are not confirmed as paid for by each of your sales channels will be viewable in the Pending Payment status. Zentail will still reserve inventory for these orders but will not route them to your fulfillment integration (ShipStation, 3PL, FBA) until payment is confirmed. Status Mismatch - orders that have a status in Zentail that differs from the status on the associated channel. - Orders were placed within a few minutes of each other on separate channels (read about the Inventory Threshold feature to mitigate your risk of back orders for this reason). Returned - All of your completed returns (RMAs). Shipped - All of your shipped orders. Cancelled - All of your cancelled orders. Orders can be cancelled directly on Zentail or by the channel. 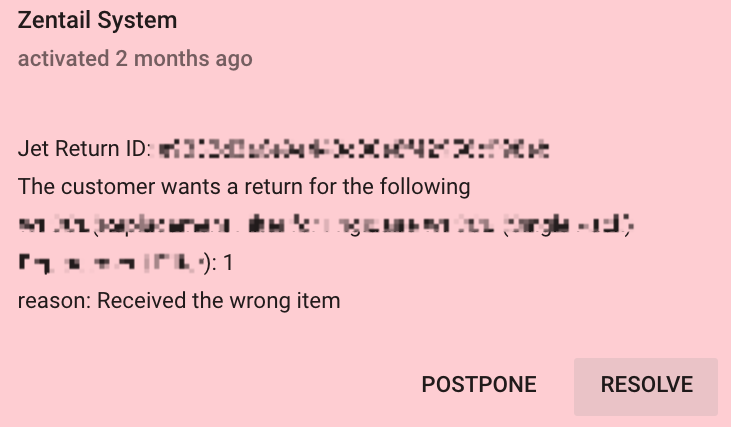 Channels often cancel orders if payment for the order failed to process. If you are purchasing your labels outside of Zentail through a system that is not integrated with Zentail, you may want to enter the tracking info directly into the orders on Zentail! This will help you keep track of your order statuses and allow Zentail to update the channel that an order has been shipped. Navigate to the Orders page on Zentail. Select the Pending or the Need to Ship filter to find orders that have not yet been shipped. Click on the order you would like to ship. If you do not need to purchase a label (you may have already done that or do not have that feature enabled on Zentail) you can disable that option using the appropriate toggle. Fill in the necessary information:- Carrier is required to mark an order as shipped- Tracking Number is required to mark an order as shipped- Service Level is optional- Cost is optional but is very beneficial for analytics purposes. If necessary, you can re-route an order to a different warehouse on Zentail. Orders can have an alert on them for various reasons. 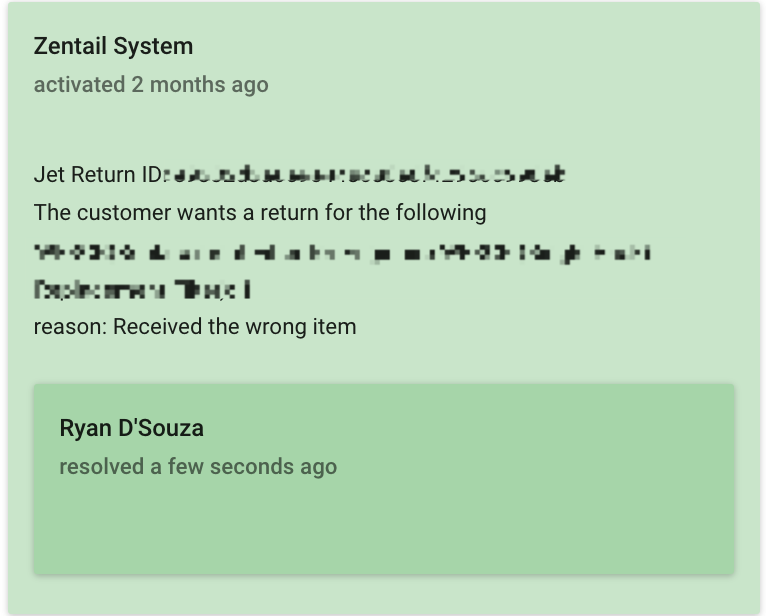 Perhaps a customer wants to return the order, or perhaps the ship-to address has an invalid country code, or there is an error coming from the 3rd party fulfillment provider's server. When an order appears in Needs Attention status, an alert message (in red) will appear in the Alerts & Comments section near the bottom of the order sidebar. Please review this message to determine what action you need to take. Once the action required by the alert is completed, you may resolve the alert to remove the order from Needs Attention. Go to the order, scroll down to the Alerts & Comments section and review the alert reason. If necessary, take action on the alert. (Optional) Enter notes -- your notes do not get sent to the channel or customer, this is often used for your internal reference. Once resolved, the alert message turns green and the order is removed from Needs Attention. Regularly checking your orders in Needs Attention is beneficial in ensuring you are resolving alerts you no longer need to see. This also helps to maintain a low and accurate number of orders in Needs Attention that actually require your attention. You can enter orders manually for Custom Order Channels by clicking the pencil icon on the bottom right of the Orders page. This often used when taking orders for your store over the phone, or for orders from a channel not integrated with Zentail. If you create the order in Pending Payment status, Zentail will reserve inventory for this order, but will not yet let you ship the order. You will need to Mark as Paid to allow the order to go into Pending status. At this point, Zentail will route the order to your fulfillment integration, if applicable, or you can then ship the order directly on Zentail. You can also create the order with a Shipped status. In this case, Zentail won't reserve any additional inventory for the order, route it to a warehouse, or send it to any fulfillment integration.